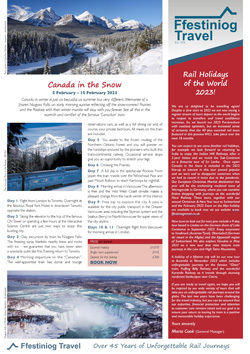 Encompassing itineraries aimed at travellers wishing to explore the world by train, as well as one aimed at those with a specific passion for railways, each holiday blends unforgettable journeys with cultural sightseeing, comfortable accommodation and convivial company, as well as ample time to explore independently as required. An experienced tour leader accompanies the group from London and throughout the tour, joined on the Peru & Bolivia trip by English-speaking local guides to assist and act as interpreters as required. NEW for 2018, Ffestiniog Travel’s first-ever dedicated tour to the USA’s ‘Golden State’ is a must for rail aficionados and TV travelogue enthusiasts alike, featuring as it does many of the locations featured in the current series of Michael Portillo’s Great American Railroad Journeys (BBC Two). Travel along the scenic west coast on Amtrak’s ‘Coast Starlight’ train, ride San Francisco’s iconic cable cars and BART (Bay Area Rapid Transit, one of the world’s widest gauge trains), ride behind Shay locomotives on the Redwood Forest Steam Railroad and Yosemite Mountain Sugar Pine Railroad, and hop on the Beach Train, a classic American ‘short line’ along the San Lorenzo River Gorge to Santa Cruz. This two-week rail odyssey also includes journeys on the California Western Railroad’s ‘Skunk Train’ and Napa Valley Wine Train (with evening meal on board), a visit to the Sacramento Railroad Museum and a lunch excursion on the Sacramento River Train, as well as plenty of sightseeing opportunities and the chance to spend two nights stay on board the Queen Mary and three nights on a paddlewheel river boat, the Delta King. Departing 4 September, this 15-day holiday costs from £4,655 pp (two sharing) including flights (London) to Los Angeles/from Sacramento, transfers, all rail travel and excursions as per the itinerary, room-only accommodation, two lunches, two dinners, San Francisco Visitor Passport for use on historic streetcars, cable cars, Muni buses and trams and Muni Metro, and the services of a tour leader from London and throughout the tour. More here. Witness Canada’s spectacular display of autumn foliage on an escorted tour aimed at those who prefer to travel away from the usual tourist beat. Take the train through the great wilderness to Northern Quebec and Ontario, marvel at the ‘Fall’ colours along the St. Lawrence River and on the Abitibi train during a scenic journey to Senneterrre, and enjoy the remoteness of Moosonee, a town of just 1,360 residents (mostly First Nation Cree) in James Bay. A visit to spectacular Niagara Falls also features on the itinerary as does time to explore the cities of Montreal, Quebec and Toronto, whilst animal lovers will adore their time spent at the Cochrane Polar Bear Habitat, the only captive bear facility in the world dedicated solely to the research into, and conservation of, these magnificent creatures. Departing 3 October, this 14-day holiday costs from £3,585 pp (two sharing) including flights (London) to Montreal/from Toronto, transfers, all rail travel and excursions as per the itinerary, room-only accommodation, and the services of a tour leader from London and throughout the tour. More here. Combining two mesmerising South American countries, this 21-day holiday travels first to Peru, where incredible scenery - from the Inca capital of Machu Picchu (reached by Vistadome train) to the impressive Lake Titicaca - awaits. Explore the capital, Lima, taking in the coastal district of Miraflores, the pre-Hispanic site of Pucllana and Huallamarca, and the priceless art and Catacombs of the Convent of San Francisco. Travel on one of the highest rail journeys in the world to Huancayo (ticking off 69 tunnels, 58 bridges and six switchbacks en route), sail to the Ballestas Islands for wildlife watching and to the astonishing floating islands of the Uros, and fly over the famous Nazca Lines. In Bolivia, experiences include a catamaran cruise to the legendary birthplace of the Inca Empire, Sun Island, and a visit to the striking Train Cemetery, where the remains of old rail equipment have been left to rust in the salt desert. Travel by 4x4 vehicle to Colchani, in the south west of the country, to view the world’s largest salt flat, Salar de Uyuni, explore the ancient city (dating back to 1580 B.C.) of Tiwanaku and take a tour of La Paz, where the Witches Market, Murillo Square and Valley of the Moon are among the many highlights. Departing 6 October, this 21-day holiday costs from £6,720 pp (two sharing) including flights (London via Miami) to Lima/from La Paz, transfers, all rail travel and excursions as per the itinerary, B&B, nine lunches, one dinner, and the services of a tour leader from London and throughout the tour, plus local English-speaking guides. More here.